Leading medical bodies are calling for a 20p-per-litre levy on soft drinks to be included in this year's Budget. More than 60 organisations, including the Royal College of Paediatrics and Child Health, are backing the recommendation by food and farming charity Sustain. They say it would raise £1bn a year in duty to fund free fruit and meals in schools to improve children's health. The soft drinks industry says raising taxation is unnecessary. The British Soft Drink Association (BSDA) says companies are already playing their part in the fight against obesity. The BSDA's director general Gavin Partington said 61% of soft drinks "now contain no added sugar and we have seen soft drinks companies lead the way in committing to further, voluntary action as part of the government's Responsibility Deal calorie-reduction pledge." He said 10p from every 60p can of drink already goes to the government in tax. "Putting up taxes even further will put pressure on people's purses at a time when they can ill afford it," he said. But Sustain says the tax is a simple measure that would help save lives by reducing sugar in our diets and raising money to protect children's health. 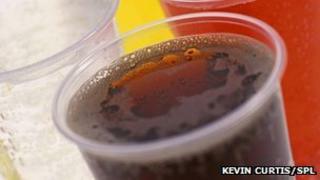 It says the UK consumes more than 5,727 million litres of sugary soft drinks a year. Adding a 20p tax for every litre sold would raise more than £1.1bn. A Department of Health spokeswoman said: "Our primary responsibility is to help the nation to be healthier. "We keep all international evidence under review. But we believe the voluntary action we have put in place is delivering results." He said: "Labour is consulting on whether new limits on sugar, salt and fat content in food aimed at children would be a better way forward. This would help parents protect their children from foods which contain excessive levels of sugar, salt and fat in a way that a tax wouldn't." Over the past 10 years, the consumption of soft drinks containing added sugar has fallen by 9% while the incidence of obesity has increased by 15%. Is New York's supersize soda ban a civil rights issue?